On August 24, Gallup released a poll showing Texas Gov. Rick Perry as the new favorite in the race for the Republican nomination. The poll soon had political tweeps buzzing, most of them wondering: How did that happen so fast? Perhaps Rick Perry capitalized on his close relationship with the Almighty and prayed for promising polling numbers. Or maybe interviewees were intimidated by the gun Perry has been known to carry while jogging (he shot a coyote that attacked his dog in February). Whatever the case, we at the Crystal Ball have no expertise in the divine and little experience with weapons, so we’ll stick to the data. The poll showed Perry leading Mitt Romney by 12 percentage points (29% to 17%) among Republicans and Republican-leaning independents nationwide. At first glance, it appears that Perry holds a commanding lead. When one further considers the speed with which he took the lead, the poll is even more striking. 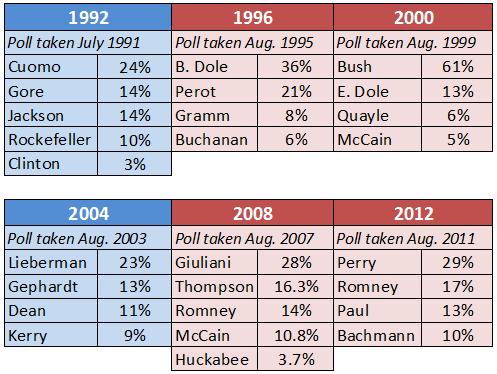 In the span of one month, Romney lost the top spot, which he held in July by 5% over Perry (23% to 18%). Does it matter? Maybe — but a cursory glance at recent history shows these early national polls haven’t always been predictive. According to Real Clear Politics, on September 1, 2007, Rudy Giuliani led the Republican primary field by a margin of 11.7 percentage points with an average of 28%. The next closest contender was Fred Thompson, with 16.3%, followed by Mitt Romney at 14%. The eventual nominee, John McCain, was a poor fourth, with 10.8%, while Mike Huckabee — who also did quite well in the end — barely registered at 3.7%. When the primaries rolled around, however, early polling frontrunners Rudy and Fred were all but out of the running. The 2008 polling for Democrats was similar. In August 2007, a Quinnipiac Poll that asked how respondents would vote if the primary had been held then found Hillary Clinton leading Barack Obama by 15 percentage points (36% to 21%). A similar survey taken by NBC News and The Wall Street Journal in July 1991 showed New York Governor Mario Cuomo (who never even entered the race) in the lead with 24%, while the ultimate nominee, Bill Clinton, who officially joined the contest in October 1991, finished fifth with a meager 3%. That’s not to say that early polling is invariably wrong. A Gallup poll from August 1995 found Bob Dole leading Ross Perot for the Republican presidential nomination 36% to 21%, with the next closest contender, Phil Gramm, at 8%. Dole won the party’s prize, while Perot ran again as an independent and Gramm never made it very far at all. Four years later, in August 1999, the same poll measured George W. Bush at a commanding 61%, while Elizabeth Dole, his main challenger at the moment, struggled with only 13%. This Dole never made it to the primaries, while John McCain became Bush’s main obstacle on the road to the nomination. Note: All polls from Gallup, except 1991 poll, which is from NBC News/Wall Street Journal. Because the nation has no national primary, national polling is invariably misleading to some extent. That’s why we all pay more attention to Iowa and New Hampshire surveys. Yet increasingly, these states — especially Iowa — do not necessarily tell us much about the identity of the party nominee. The Real Clear Politics poll average for Iowa currently has Michele Bachmann in the lead at 19.7%, followed closely by Romney with 19.3% and Perry at 19.0%. Averages can be deceptive, however, since the two latest polls have Perry in the lead. Just as in the Hawkeye State, surveys in New Hampshire diverge significantly from the national Gallup numbers. The Granite State’s favorite is Romney, who leads with 32%, followed by Bachmann (13.3%), Ron Paul (10.0%), and Perry (9.7%). Yet the most recent New Hampshire poll shows a shuffling too. Conducted in mid-August by the Republican group Magellan Strategies, the survey had Romney at 36%, doubling up on Perry’s 18%. Unquestionably, Perry has made a big splash in what so far has been an unimpressive presidential field for many Republicans. But any conclusions must be very preliminary. Perry may or may not prove to have the staying power to maintain his edge and, more importantly, translate it into victories in the early primary states. The polls are fun to watch, and at the Crystal Ball we do more than our fair share of it. Still, if history is any guide, no one — least of all the candidates — should live or die by the late summer polls in the year prior to the actual nomination fight. Politics is too dynamic a business for reliance on static polling numbers that quickly go stale. Tim Robinson is a graduate of the University of Virginia and a new staff member at the U.Va. Center for Politics. Among his many duties, he assists with the weekly production of the Crystal Ball.